Mark Onspaugh is a native Californian who grew up on a steady diet of horror, science fiction and DC Comics. He’s a proud member of the Horror Writers Association and the International Thriller Writers association, and has published over 3 dozen short stories in the past few years. In addition to the produced film Kill Katie Malone, he has several other screenplays in various stages of development, and was also one of the writers of the cult favorite “Flight of the Living Dead”. While Onspaugh is definitely a fan of the horror genre, he also writes science fiction and comedy. He polished his comedy writing (and improv skills) at the Groundlings Theater in L.A., where he studied under Lisa Kudrow (“Friends”), Michael McDonald (“Mad TV”) and Heather Morgan (“The Dana Carvey Show”). Earlier in his career, Onspaugh studied Special Effects Makeup in college and continued to pursue this passion under the tutelage of premiere makeup artist Thomas R. Burman (“Invasion of the Body Snatchers”,” Cat People”, “Scrooged”) with additional lectures by such notables, among others as Oscar winning makeup artist Rick Baker (“American Werewolf in London”, “Men in Black”, “Planet of the Apes”). Onspaugh also worked with Rob Bottin (“The Howling”, “The Thing”, “Seven”) on “Amazing Stories” as a puppeteer and continued to learn much about the art of makeup effects from Bottin throughout their friendship. Onspaugh’s practical experience with effects influences his writing to this day. STRANGERS is a backdoor pilot for a series of the same name. Onspaugh has written the STRANGERS bible, debut episode and a regular episode. Onspaugh’s previous television credits, include episodes for Night Man (“Burning Love”), X-Men Animated (“Secrets, Not Long Buried”) and Street Fighter Animated (“Getting in Guile”). Mark knows people expect horror writers to be lurking misanthropes, but hasn’t lurked since leaving L.A. A native Angeleno, he now lives on the central coast of California with his wife, author/artist Tobey Crockett and two off-kilter cats. 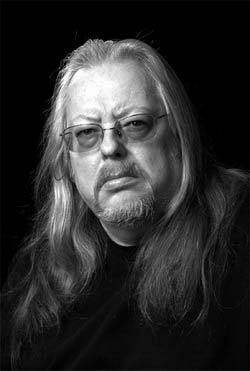 You can find all Gothic.net articles and fiction relating to Mark Onspaugh at tag Mark Onspaugh. Posted by Gothic.net on Wednesday, May 11th, 2011. Filed under Who's Who. You can follow any responses to this entry through the RSS 2.0. You can skip to the end and leave a response. Pinging is currently not allowed.